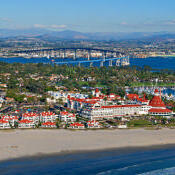 The resort town of Coronado lies across the bay from downtown San Diego. Known for its wide, white-sand beaches, historic landmarks and relaxed, small-town feel, Coronado hosts more than 2 million visitors annually. The island -- actually a peninsula connected to the mainland by a strip of land called the Silver Strand -- has 15 hotels, including several world-class resorts, and more than 70 restaurants. Coronado’s biggest industries are the military and tourism. It’s no surprise, then, that the island’s largest employers are the U.S. Navy and, at a distant second and third, the Hotel del Coronado and Loews Coronado Bay Resort. U.S. Navy installations include Naval Air Station North Island, Naval Amphibious Base Coronado and the Silver Strand Training Complex. In addition to the Del and Loews, both four-star hotels, other top resorts on the island include the Coronado Island Marriott Resort & Spa and the Coronado Beach Resort, all steps from the ocean. Coronado gives Golden Hibiscus award to mixed use development. Would San Diego cities benefit from a Port breakup? Does returning the tidelands managed by the Port District to the five cities that front them make sense? Coronado has used the Main Street Program to revitalize Orange Avenue.